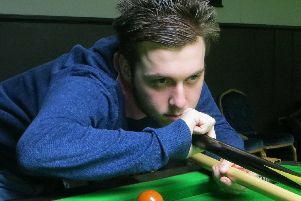 Daniel Harvest, from Portchester, reached the semi-finals of an event on the World Disability Billiards and Snooker circuit. The profoundly deaf cueman lost 2-1 to Shabir Ahmed, the eventual tournament winner, in the Hull Open at the Tradewell Snooker Centre. The 47-year-old beat Barry Rogers, Tony Davies and Assad Ullah all by 2-0 scorelines in the group stages of the event for deaf players. Harvest, whose highest break is 53, then overcame Blake Munton 2-0 in the last-eight. Elsewhere, Jamie Wilson retained second spot on the EASB Regional Junior Tour South following a semi-final exit in the second leg. 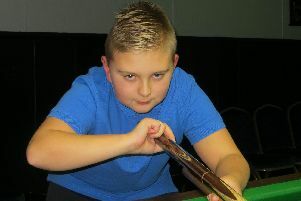 The 15-year-old talent from Havant lost 2-0 to home player Steven Hughes at Chandlers Ford Snooker Club. Earlier, he edged Riley Ellis 2-1 on the final black in the last-eight. Wilson continues his bid to earn promotion to the national under-21 circuit in the third leg of six in Brighton tomorrow week. Meanwhile, Harry Wilson knocked in his second highest break using his dad’s cue during the Monday Junior Snooker League at Waterlooville Sports Bar. The 12-year-old compiled a 38, two below his personal best, against Owen Jenkins. Zak Truscott takes an 11-point lead over Jamie Wilson into the remaining three weeks. Ryan Kneller has a five-point lead over Josh Richards at the top of Division 2. Former champion Dean Russell squeaked past Billy Reid by one point to take an early lead in the new Wednesday Junior Snooker League. Defending champion Samuel Laxton was undefeated in his four-man group and trails Russell by one point. Laxton’s 11-year-old brother George missed a tricky pink for a first 20, equalled his personal best 18 and beat Cuestars Under-21 Bronze Tour rankings leader Jenkins 2-1. And third-placed Rhys Pearce kept up the pressure on the top two in the Junior Pool League. The 12-year-old won the round-robin group despite a shock defeat by debutante Chloe Ward. Pearce is now two points shy of defending champion Jayden Brookes and 11 adrift of front-runner Keira Hiscock with eight weeks remaining. Three wins took George Barber to within one frame of second-placed Callum Olivares in Division 2.